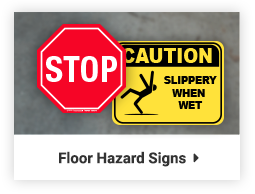 If your facility has hazards, you need to mark them with hazard signs. OSHA requires that employers use hazard signs that comply with the ANSI Z535 standard for safety signs (which you can learn more about in our Guide to OSHA Safety Signs). 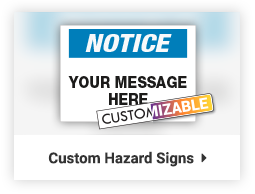 These signs can mark almost any type of hazard, but many need to have a specific format that uses a signal word, header, text, and pictogram. The signal word will be Danger, Warning, or Caution, depending on the severity of the hazard. Signs also have assigned colors based on the amount of danger present. 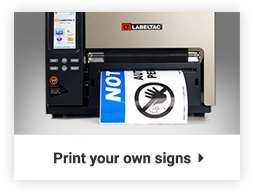 Shop our selection of pre-made hazard signs and labels below. 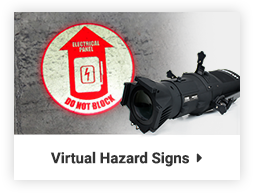 You’ll find common signs related to electrical safety, machine safety, personal protective equipment, and more. If you’d like a custom hazard sign or label, get in touch. We can make signs that meet your exact specifications.